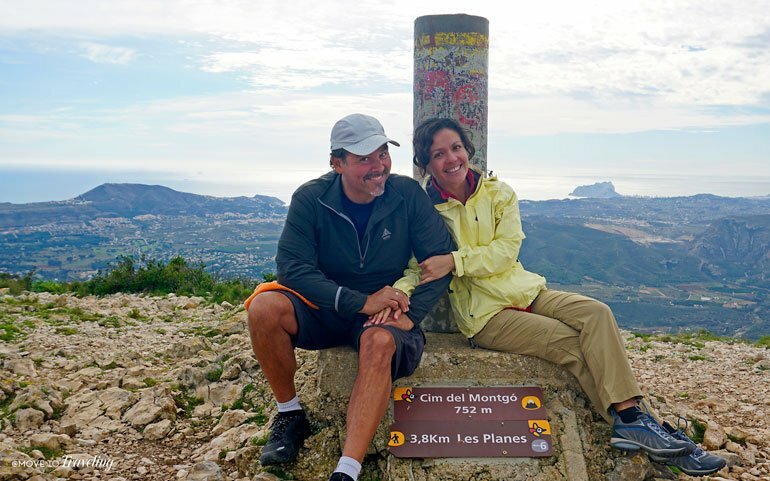 Hiking Montgo is something that we had talked about for the past two-plus years that we’ve been living in Denia, Spain. Yet we finally summited recently, and now feel like we’re on even closer terms with the endearing spirit of El Montgó that is magical for us and many others who encounter him. What we originally found for access and trail information, what to expect and more, seemed to vary over these past years. We wanted to fill you in on what we now know firsthand, so that you can enjoy this beautiful and amazing hike on Spain’s Costa Blanca. 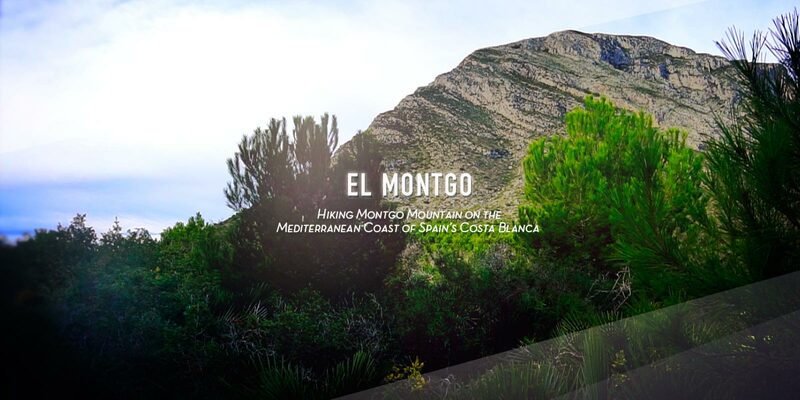 Watch two short videos we’ve created about El Montgo. One is of us hiking the mountain, and the other highlights ‘his personality’. That’s right. Even though in Spanish the noun mountain is feminine, so la montaña, we and others refer to Montgo as El Montgó. Being in its presence, it feels like a him. It probably helps that from the Denia side, the end of the mountain facing the sea looks like the face of an old man. Montgo is a lone mountain that rises up right off the Mediterranean shores of the Las Rotas beach in Denia. He’s long and sits almost like a lion crouched down, with the inland end lower and then rising up to its highest point, which looks like the top of his head, on the sea end. From there a long plateau, known in Valencian as Les Planes, stretches out to the seaside cliffs and the Cabo de San Antonio, which dramatically drop into the sea in sheer rock walls. El Montgó is impressive, to say the least, and being right alongside Denia, he watches over the charming, Spanish town we call home. From practically anywhere in the town, you can look up and catch a glimpse of Montgo looking down on you in the town. Above Image – El Montgó with his head in the clouds. As you drive into Denia from the direction of Valencia, you get a distinct view of the ridge top of Montgo. It actually looks somewhat flat on its top and like a ramp sloping away from the inland area. Montgo is also right in between the towns of Denia and Javea (or Xabia in Valencian), with various other tiny villages around its lower, inland end. From each side, you get distinct views of the mountain. 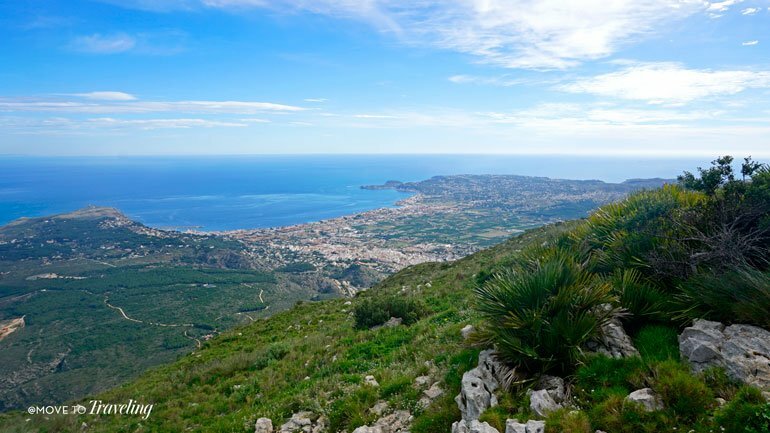 The side facing Javea shows more earthy-red rock and cliff walls, while seeing Montgo from Denia reveals his greener side of pine trees and shrubs. The Denia side still has plenty of steepness and cliffs as well. There are two trails that we know of from the Denia side of Montgo. The one that we took on this hike is the one that is the most direct to the summit, on the sea-end of the mountain. We went with our friends Neil and Steve, and it really helped that Neil had done the hike before. So Neil was our guide and drove us up to the Denia shooting range club, which is located on the road from Denia to Javea, or Xábia in Valencian (it’s literally called in town ‘Carrer de Denia a Xabia’), but is also the CV-736. For the turnoff to the shooting range, there’s not a street name, so be watching for the shooting range club sign and a dirt road that is a right hand turn (if you’re coming from Denia). There is also a sign for the Montgo trailhead. We took this dirt road down, staying to the right, and ended up at the large dirt parking lot right in front of the shooting range building. There’s a gorgeous vista from here as well. Then walking back a bit to the entrance to the parking lot, is the trailhead map and sign for starting out. 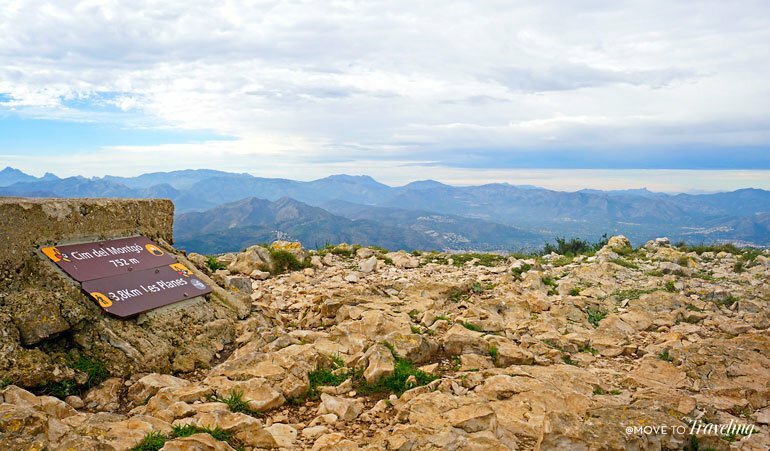 Trail Tip: On the signs, Cim Montgó means summit Montgo. From here, we simply followed signs and were glad to see that the trail was well-marked and maintained all along the way. Early on, we saw where the ‘Carretera de La Colónia’, another trail from town, ends and meets up with this trail. We’ll talk more about that next. 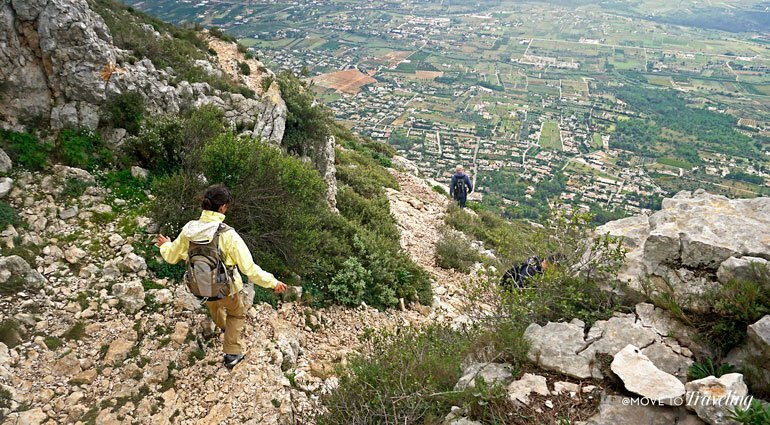 The biggest thing that people wonder about hiking Montgo is it’s level of difficulty. We would say it is an intermediate hike, since it does get quite steep. All along the way, the trail is very rocky, with sharp rocks so wear hiking shoes with good soles. Early on in the hike, the trail is made of switchbacks which are a steady uphill trek, affording gorgeous vistas as you gain higher and higher ground. Then nearer the top, it does get even steeper and you need to use your hands to grab onto boulders and pull yourself up as the trail climbs along the edge. At this point, it’s also more on the Javea side. If you’re afraid of heights or get vertigo, this part is especially why it’s not the hike for you. Once on the summit, it’s a nice large area, mainly rocky but with some grass, and you’re right on the top of Montgo’s head. The view is 360 degrees, and you can see the island of Ibiza and possibly the island of Mallorca on a very clear day. Our weather was overcast so no spotting the island of Mallorca, but we could see Ibiza. 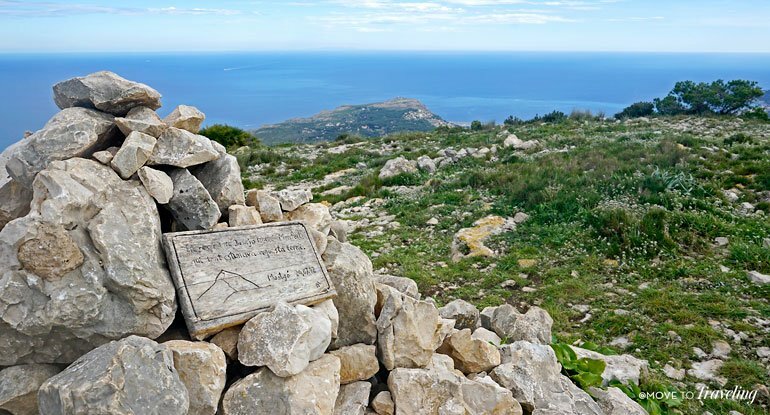 While the vistas of the Mediterranean coastline of the Costa Blanca are spectacular, the inland views of the many mountain ranges in this area of the Marina Alta, are also breathtakingly beautiful from this summit. We came back down on the same trail that we went up. In total, this hike took us just under 2 hours, each way. Earlier this year, at the beginning of summer, there was a fire on this sea-facing ridge of Montgo. Now months later, when hiking the switchbacks, we could see the burned area still distinctly marked by brush and trees that were still black and charred. But this, along with the rain we recently began having in the fall, transformed the rest of the vegetation into lush, thick grasses of verdant green and various colors of wildflower. All along the way is a plethora of fauna, including wild lavender bushes and rosemary, which smells incredibly good. Our friend and hiking companion Neil, who has hiked up Montgo before, said that the trail was the greenest he has ever seen it. Another interesting observation we made of the terrain is that as we began to climb higher, the rocks took on a red sandstone shade of color. In contrast with the grasses and wildflowers, it really stood out. For wildlife, we saw many small Sand Martin birds flying right at eye-level with us, and below us as we continued upward. Yet the surprise we got was discovering countless caracoles or snails all over the place. 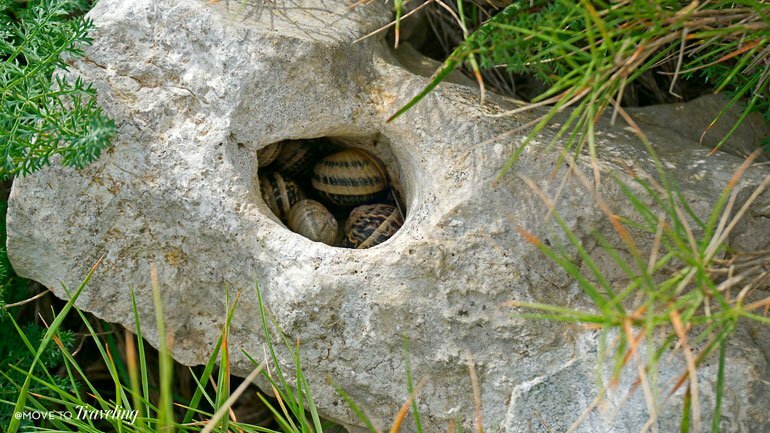 They were even on the summit and many times several of them would be holed up inside the rocks. Keep in mind with these trails, that they can lead to the summit, but hiking Montgo is about more than reaching the top. These trails give a lot of other great things to see along the way and make for a great hike in and of themselves. 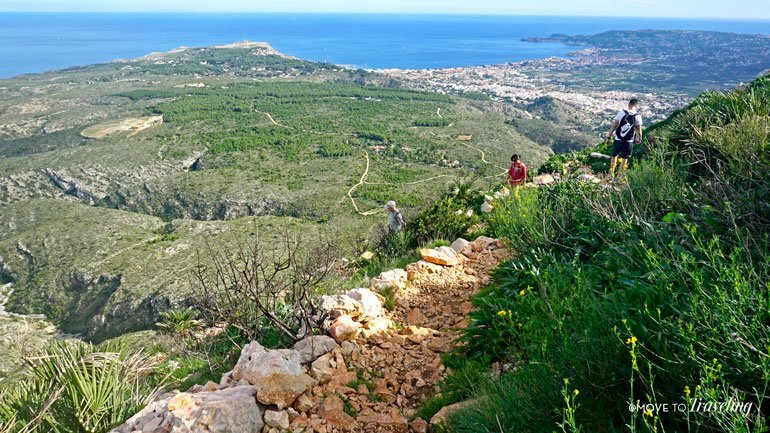 We refer to this one as the trail from Pare Pere (a nearby ermita, or little chapel on the Denia side) which you access from starting on the Carretera de La Colónia. This carretera is also a great walking path of its own that used to be a road. It starts with a few gradual switchbacks, but then levels out to a steadily flat wide path that hugs the side of Montgo. The views are very open and spectacular, even though it’s not as high up the mountain. You can see the sea and Denia below, and even further down the coast towards Valencia. From this trail of La Colónia, you can go either direction, left or right (sea-direction or inland-direction) to the summit. 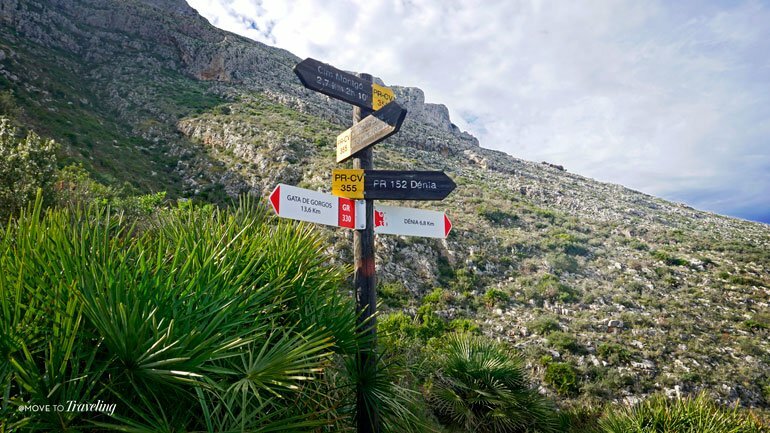 If you go sea-direction (to the left), the trail reaches turn-off’s to hike up to two caves that are in the side of Montgo, and not quite half way up the mountain side facing Denia. These are the Cova del Camell and the Cova de L’Aigua (Valencian for cave of water). We’ve been to the Cova de L’Aigua twice before, and it’s a nice shorter hike that is great to enjoy on its own as well. If you take this route to summit Montgo, you continue down La Colónia past the cave of water, in the direction of the sea. This does however, add about 45 minutes to an hour to the hiking trail that we took. Go the inland-direction (to the right), and you can hike to the large cross, which is in the middle of Montgo’s top ridge and viewable from Denia. We recently heard that the cross was placed there as a memorial to a group of people died there when their small planed crashed at that spot, but we can’t find information on this and aren’t sure of the details. Either way, it is not as high as the summit, but is still a great hiking destination and you can continue from there to the summit, or vice versus, reach the cross from the summit. Then there’s the trail to L’Alt de Benimaquia, which is an incredible archeological site of an Iberian settlement that flourished on the northwest corner of Montgo in the 6th century BC. The trail access is near the small village of La Xara at the back of Montgo and off the road CV-735. There is a restaurant called Restaurante Punta Benimaquia that is just a tiny bit down and across the road from the turn off which leads to the trailhead. In the summertime, you can find some guided tours to Benimaquia which go there from Denia. 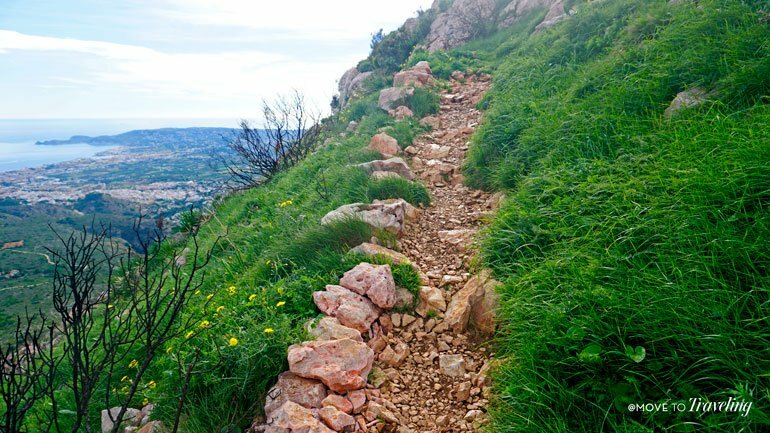 This trail is great as a shorter trail that goes to see the settlement ruins, but then it also continues on to the summit of Montgo. Keep in mind that it’s longer than the other trails. While we haven’t done this particular trail, it’s definitely on our list of upcoming hikes. Lastly, one of the other trails is a Javea circuit to the eye of Montgo, which is where the rock face just below the summit actually looks like a large eye. From what we understand, the trail continues on just a little further to the summit. Wear layers for varying weather since it gets colder as you go higher and can be very windy on the summit. But it can also be very warm as you hike up and you don’t want to overheat either. Pay attention to, and heed, the weather. 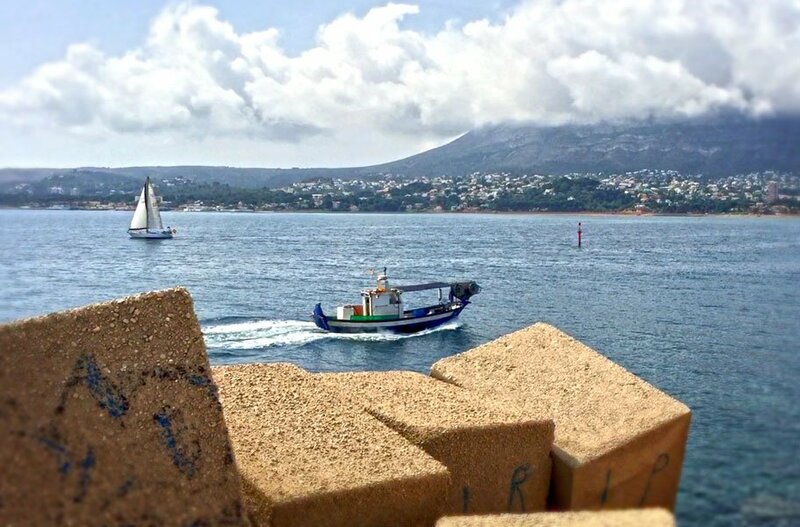 It’s very unpredictable on Montgo and changes quickly, especially being right on the sea. Stay on the trail. Hey, this is basic boy scouts stuff. It’s not only so you don’t get lost, but also to preserve the natural environment from unnecessary erosion. So respect the terrain and don’t go off trail! Well there you have it! 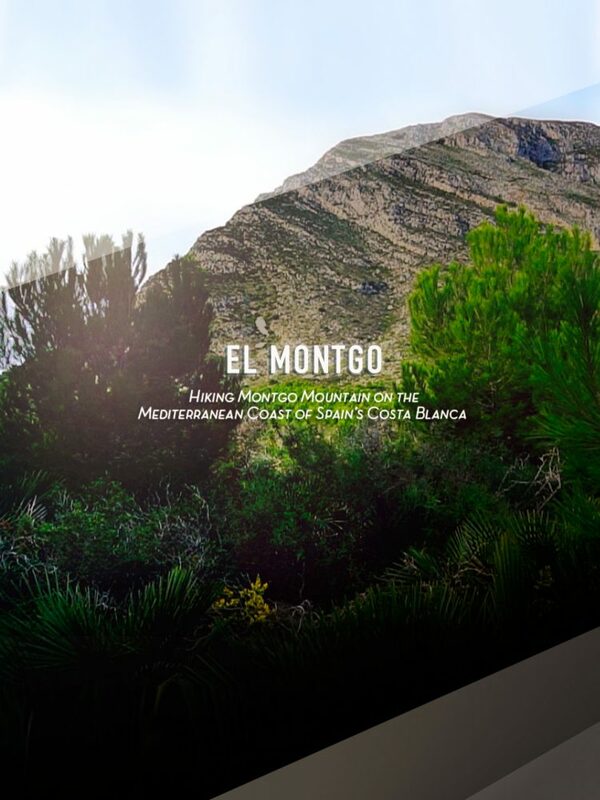 Now you too can explore and summit El Montgo. We’ve met several people, local Spaniards included, who say that Montgo is magical and holds a powerful energy in this area. For many, it’s one of the countless highlights and attractive factors of living here in Denia, Spain. 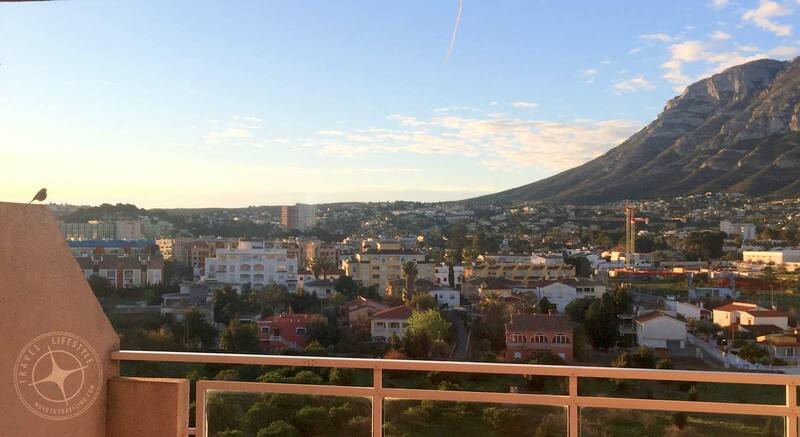 From our home in the center of Denia, we have a fantastic view of all of Montgo, and we just love it. 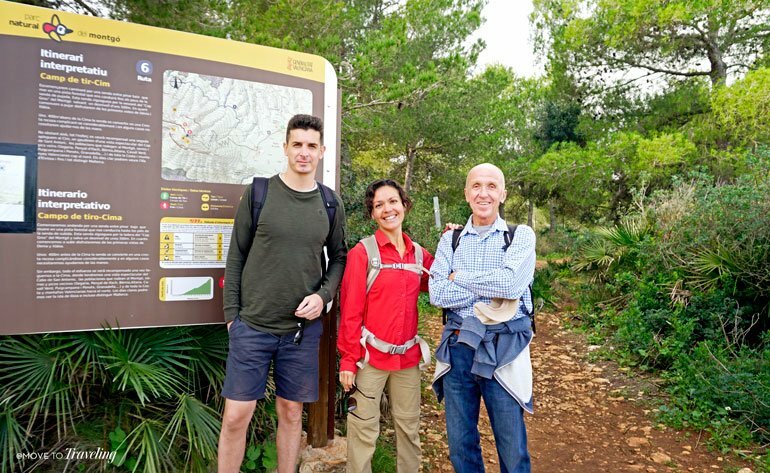 Like others, we feel there’s a wonderful energy to the mountain and it is a gorgeous, natural area that is respected and cherished here in Denia and the Marina Alta. Visit El Montgo in the fashion that you desire, and you’ll be gifting yourself with a great experience of the natural environment in this part of Spain. Have you ever heard of ‘El Montgó’ or hiked it? If you questions, or insight to share from your own experiences, please share below in the comments. As we hike more of the different trails on Montgo, we will update this post as well, so subscribe to stay informed.